Post-Bac Admission (APB) centralises the administrative procedures for higher education. Candidates start entering their enrolment preferences in March and can validate them in order of priority until end May. The IPE, Paris Dauphine, private courses and nursing schools are not offered in APB (preparatory classes for paramedical and social courses are offered). This page only takes into account applications from pupils in the final year of secondary school. The Insee employment survey is carried out on a sample of households (continuously since 2003) and measures unemployment according to the International Labour Office (ILO), providing data on professions, employment of women or young people, duration of employment, temporary jobs (see EES10EN_ES_19). The Generation 2010 survey: between March and July 2013, the Centre for Study and Research in Training and Education Policy (Céreq) interviewed a sample of young people who had left the school system during or at the end of the 2009-10 academic year. The purpose of this survey was to study differences in conditions of access to jobs according to initial education and individual characteristics. Women outnumber men in higher education, but are less likely to enrol in selective or scientific courses and are in the minority in PhD programmes. In 2013, their unemployment rate three years after leaving was higher than men for nearly all levels of qualification, and their employment conditions were less favourable. After achieving better results than boys throughout school, on average more girls than boys obtain their baccalauréat: in 2015, in one generation, 83.2% of girls passed their baccalauréat compared with 72.7% of boys 1. 52.2% of students passing their baccalauréat in 2015 were girls. They are almost as likely as boys to continue their studies in higher education, but tend not to take the same study programmes (chart 13.01). Under the Post-Bac Admission system, 45% of first preferences entered by women were for university (excluding IUT) compared with 31% for men. Conversely, they requested less frequently selective courses such as the CPGE (8% compared with 10%), IUT (11% compared with 17%) or STS (26% compared with 32%). At university (excluding IUT), they were less inclined to enrol in a scientific or sports course. Although in total 55.1% of students were women in 2015-16, their proportion therefore varies hugely according to the courses. Women only accounted for half the enrolments in STS, 39.5% in IUT and 42.1% in CPGE (chart 13.02). Conversely, paramedical and social courses are attended by 84.5% women. At university, they account for 69.7% of students in Languages, Arts and Humanities. In the last ten years, their proportion has slightly increased in the scientific courses at university, but they are still a minority. However, they represent 60% of students studying Healthcare, Life Sciences, Earth and Astrophysical Sciences (chart 13.03). While they represented 56% of students enrolled in Bachelor's degree programmes and 59% in Master's programmes, they represented only 48% of PhD students. Of female students leaving initial education in 2012, 2013 and 2014, half obtained a higher education qualification, compared with only 40% of men. 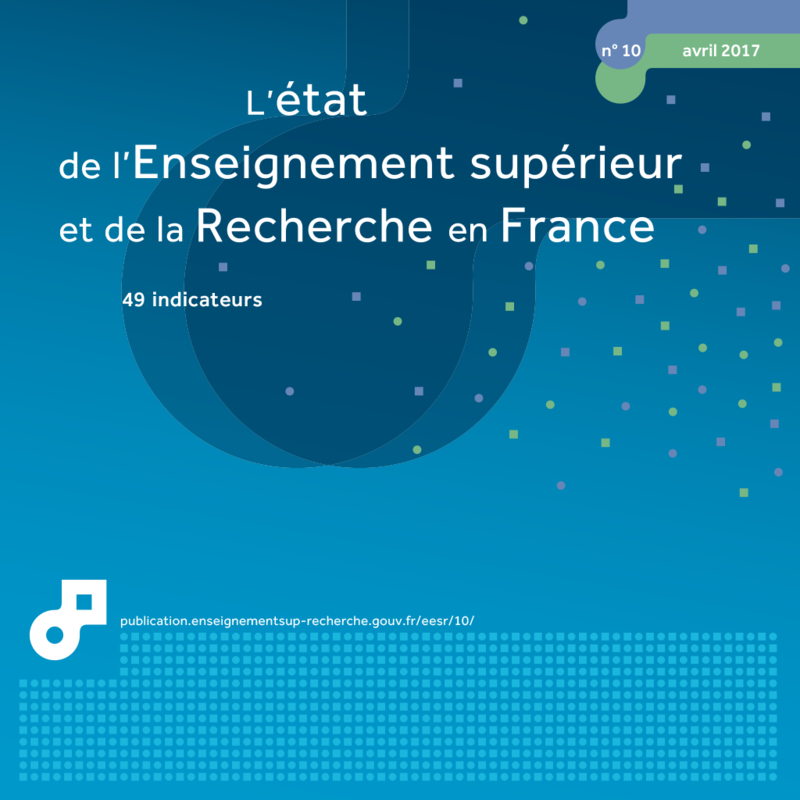 Female higher education graduates were most likely to have a Bac + 5 university degree and a Bac + 3 paramedical or social work degree, whereas men were more likely to have degrees from specialist universities (écoles supérieures) and short-cycle Bac + 2 courses (BTS or DUT) (table 13.04). In 2013, three years after leaving higher education and for each level of qualification (excluding the Bac + 2 and + 3 degrees in the healthcare/social sector and PhDs), the unemployment rate for women was slightly higher than for men. However, despite being better qualified than men, women experience an overall unemployment rate equivalent to that of men. In direct contrast to the unemployment rate, the share of immediate or fast access paths to employment increase with the qualification level. The proportion of women following this type of path should therefore be higher than for men. In practice, fewer women follow these paths at each level of qualification (except for Bac + 2 and + 3 healthcare and social sector qualifications) and overall slightly fewer women follow these paths than men. Despite this structural effect, their employment conditions are also less favourable: they are less likely to have a permanent job (54% compared with 61%), often work part-time (15% compared with 7%) and are less likely to be managers (27% compared with 32%). This last difference has however markedly decreased since the last survey carried out three years earlier (table 13.05). 1 Proportion of Baccalaureate holders in a generation: this is the proportion of Baccalaureate holders in a hypothetical generation of people with, for each age, the candidate and pass rates observed for the year in question. Extract from the chapter "13. gender equality in higher education". 1 including engineering courses dependent on universities, National Polytechnical Institutes (INP), technology universities and engineering courses run in partnership. 2 2014-15 instead of 2015-16. On average in 2012, 2013 and 2014, out of 100 women who left initial education, 49 received higher education qualifications.